A long wait just came to an end as England started their campaign at World Cup. They faced one of the toughest countries in the tournament: Italy. As is to be expected, England had their asses kicked, though apparently this time it wasn't down to poor timing and hapless defence - it was me. Yeah, me. A little while back we hosted yet another one of our Sunday lunches and took our time enjoying the Italian feast. Ever greedy for more pork I had made some porchetta (yep - on the blog soon!) - that Roman specialty. Already this resulted in minor eyebrow-movement signalling mild disapproval. Ciabatta (totally store-bought - I've never had much luck with that one. Though... should any of you have a foolproof recipe I'd be happy to take it off your hands!) brought on the eye-rolling. And then, as I carried out Caprese, mozzarella, basil and tomato salad, its gloriously Italian colours were met with exasperated cries. Apparently I had single-handedly torpedoed the entire tournament and put a curse on the opening game. Me! The person who doesn't dare to leave the house on a match day without the lucky underwear! This salad continues with the same colour scheme (no, I never do seem to learn). Odd as it may sound, it's become a bit of a classic in its own right. 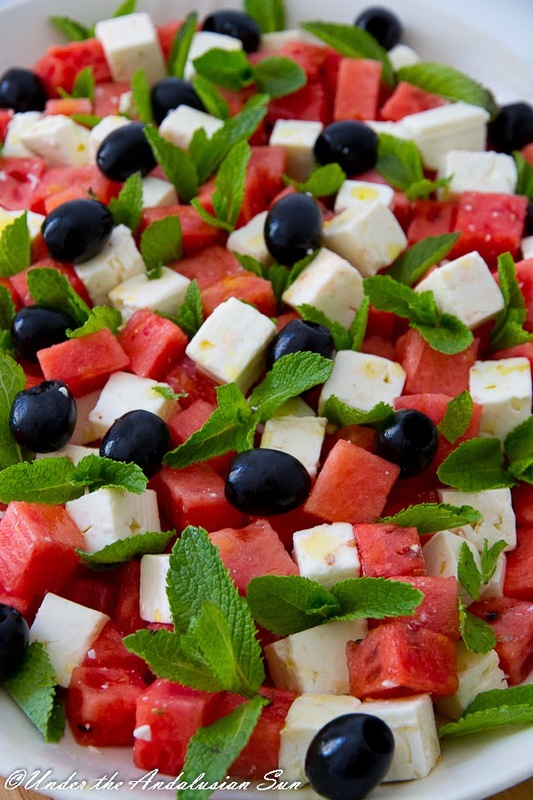 The sweetness of the watermelon combined with saltiness of feta and the freshness of mint leaves... it just works. 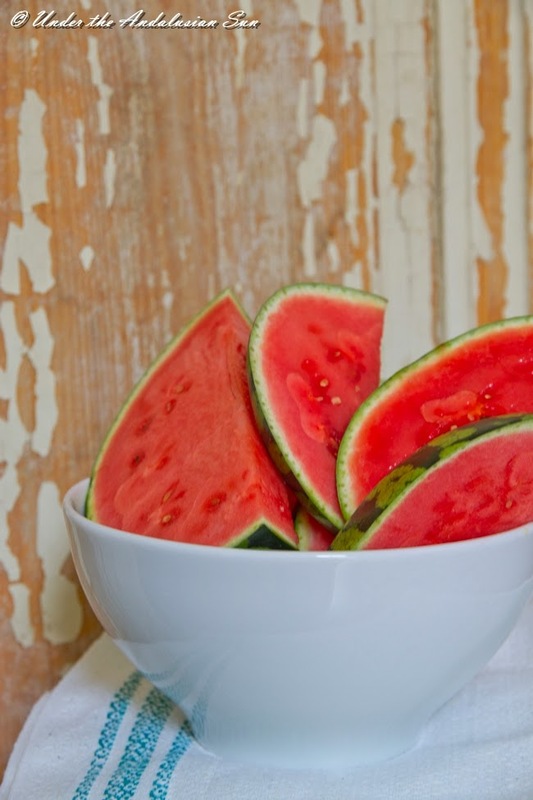 And watermelon with black pepper... aaah. You can skip the olives and mint can be substituted with basil or coriander. 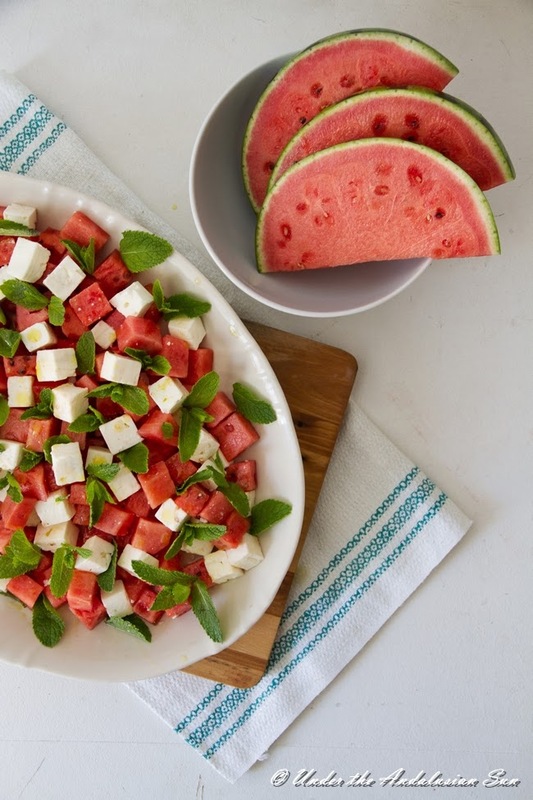 Grilling the water melon brings a whole new dimension to the salad. Just remember: like with anything this simple you want to make sure the few ingredients that are needed are good. So, do go for a good, soft, crumbly feta and leave those rubbery squeaky toys in the super market, ok? Cut the melon in half , remove the rind and then cut the flesh into 1 cm cubes. Cut feta into similar size cubes. Combine with melon cubes and mint leaves (and, if using., olives, cut in half). Sprinkle black pepper and a drizzle of oil on top. Summery, fresh, quick and easy... if only the same could be said about the English football!